"Dear Tonechka, I don't know whether you will ever read these words, but I know for sure that this is my last letter. A fight is on, a heated, deadly fight. Our tank has been hit. Fascists are all around us. The Ostrovsky street is filled with corpses. They look like large motionless lizards. It is unbearably hot, and I'm thirsty. Your portrait is lying on my knees. I am looking at it, into your light blue eyes. Don't cry. You probably won't come to my grave. Will I have a grave?" - Soviet soldier Alexander Golikov, in a letter to his wife. Golikov was killed later that same day. MPAA Rating: Not Rated for graphic depictions of warfare, destruction, and wartime atrocities. Definitely not for children. World War II has always come to us in images we are used to seeing in black and white. Virtually all newsreel coverage of the war shown back in the U.S. during that era came only in shades of gray. However, in the late 1930s and early 1940s, color photography and film was just starting to come into its own. In 1982, British film researcher Adrian Wood began searching in archives around the world for color films from the Second World War. What he discovered was hundreds of hours of full color footage, some taken by civilian amateur cameramen, some by professional camera crews, some by the soldiers themselves, and most of it never before seen publicly. His discovery formed the basis for WWII: The Lost Color Archives, a three-part series originally aired on The History Channel in earlier this year. New World Order — Beginning with pre-war footage of Germany and Adolf Hitler, this episode goes on to cover the first year of the war, 1941. Subject areas include the German invasion of Poland and France as well as Britain's ill-fated defense of her: the formation of the British Home Defense forces; the bombing attacks on London; the German invasion of the Soviet Union, and the beginnings of America's involvement in the war. Total War - This episode chronicles the middle years of the war, beginning with the attack on Pearl Harbor and running through early 1944. Additional subject areas covered include women working; the treacherous Atlantic Ocean crossings; the German occupation of the Soviet Union, Poland, and Yugoslavia; the battle for Stalingrad; the firebombing of Hamburg, and the U.S. invasion of Saipan. Triumph and Despair - This episode chronicles the final year of the war, beginning with the Allied invasion at Normandy and Cannes. Additional subjects covered include the inward invasion from Normandy; the liberation of Paris; the taking of Berlin; the liberation of Buchenwald and Dachau concentration camps; the VE-Day celebration in London; the deadly invasion of Okinawa; the dropping of the first atomic bomb, and the VJ-Day celebration in New York City. In much the same style that documentarian Ken Burns employed in his landmark PBS series The Civil War, the stories behind the images shown are brought to life with the reading of diary excerpts and letters written by those who were there and witnessed events firsthand. The series is narrated by actor and longtime History Channel contributor Edward Hermann and features introductory and conclusion segments from Roger Mudd. Additionally, WWII: The Lost Color Archives features wonderful original music from composer Chris Elliott. While hardly a shortcoming of the presentation, I feel compelled to mention one significant caveat. WWII: The Lost Color Archives is not a thorough documentary treatment of the war. The events and arenas captured on color film during the war were very limited. As such, the creators of this series were understandably forced to write around the footage, not the other way around. As such, many significant events are glossed over, sparingly covered, or not mentioned at all. Even with unlimited footage of every major event of the era, it would be impossible to give a thorough overview of the war in the 135-minute runtime of this documentary series. Instead, WWII: The Lost Color Archives should be viewed as a very effective supplement to the existing body of knowledge readily available about the conflict. In this role, the series shines. Most of the footage is amazing and the included audio content if often compelling and touching. Image Transfer Review: It would only be fair to judge the image transfer of a DVD presentation against reasonable expectations based on the age and condition of the source material. Keeping this in mind, WWII: The Lost Color Archives is extremely impressive. I was quite pleasantly surprised at the quality, detail, and overall cleanliness of most of the footage contained in this series. Yes, much of it has a significant amount of blemishing, lack of crispness, and poorly realized colors. However, this footage is more than 50 years old, was shot using primitive camera equipment (by today's standards) and much of it was filmed by amateurs. Weighing all of this in, this series is truly a visual treat. Audio Transfer Review: As would be expected of a documentary series originally created to be aired on television, WWII: The Lost Color Archives is presented in Dolby Digital Stereo. Much of the footage has accompanying audio and it should be no surprise that this audio suffers from both its age and the quality of equipment on which it was originally captured. Modern elements of the audio presentation, such as the narration, the diary and letter excerpts, and the original music, all sound crisp and pleasant. 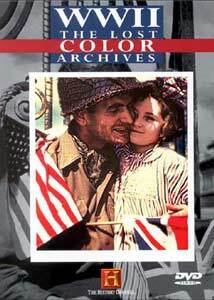 Extras Review: WWII: The Lost Color Archives comes with only one extra, a "bonus footage" segment which includes over 15 minutes of samples of the better color footage not actually used in the documentary series. Among this bonus footage are almost five minutes from home movie footage of Adolf Hitler and Eva Braun and several more of fantastic fighter nose camera film. The footage is set to music and is offered without commentary. The two discs in this set are packaged in individual Amaray keepcases contained together in a cardboard sleeve. For history scholars and those interested in getting a fresh visual glimpse of the Second World War, WWII: The Lost Color Archives is a must-watch.